Sorry to say but those bacon and hot dog lovers need to read this to avoid having that number one killer disease in the world.According to a recent report issued by the World Health Organization (WHO), by only consuming 50g of processed meats (less than 2 slices of bacon) per day, you increase your chance of getting colorectal cancer by 17% percent. On the list of most popular cancer causing products are processed meats alongside with tobacco. Nonetheless, it’s been found that red meat does offer some health benefits, and instead of completely eliminating organic unprocessed meat, you should only decrease the amount you are consuming. Under the term processed meat is meant every meat that is treated and transformed in order to extend its shelf life or change the taste. These include salami, canned meat, bacon, sausages, hot dogs, etc. 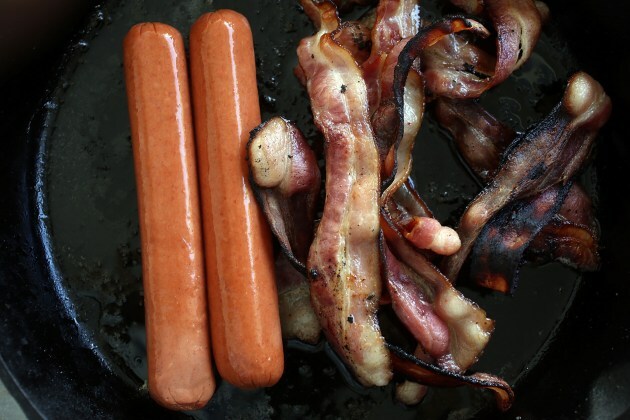 Processed meat contains sodium nitrite, a chemical that is believed to be carcinogenic. While even unprocessed meat can cause some heath issues, problems appear only with excessive consuming. If you really love red meat, then go for the unprocessed and organic one and don’t overeat it. The “Meat Advisory Panel” organization suggests that and processed meat is not that much harmful. They also state that with avoiding meat, you will not protect yourself from cancer. According to them, in order to protect yourself from cancer you should avoid cigarettes, too much alcohol intake, and maintain a normal weight. The organization also states that there are not enough evidence that processed meat is causing cancer. Other reason why you should cut back on red and processed meat is that the animals from which these products come, are fed with various synthetic foods in order to grow faster. And by consuming the meat from the animal you are consuming the chemicals they were fed. Start by gradually decreasing the amount of meat you consume. Or you can begin with consuming only one serving of meat per week, and then you will eliminate meat consumption completely. Don’t forget to increase the intake of fruits, vegetables, and other healthy foods.